OK, are you ready for another twist on the original? 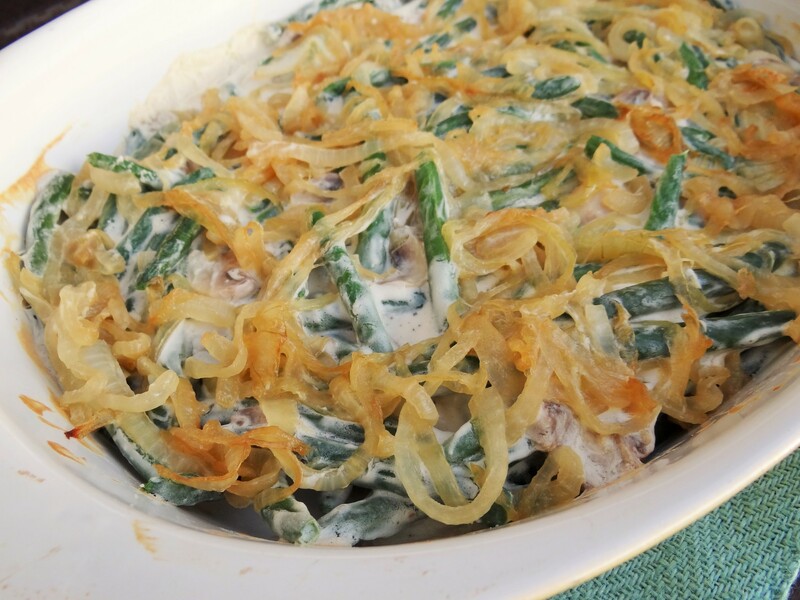 Probably everyone has tried or at least seen the All American green bean casserole that is made every year, especially at Thanksgiving. The one with the green beans, mushroom soup and crunchies on top. Well, I have decided to make it a little healthier and fresher than the one we all know and love. 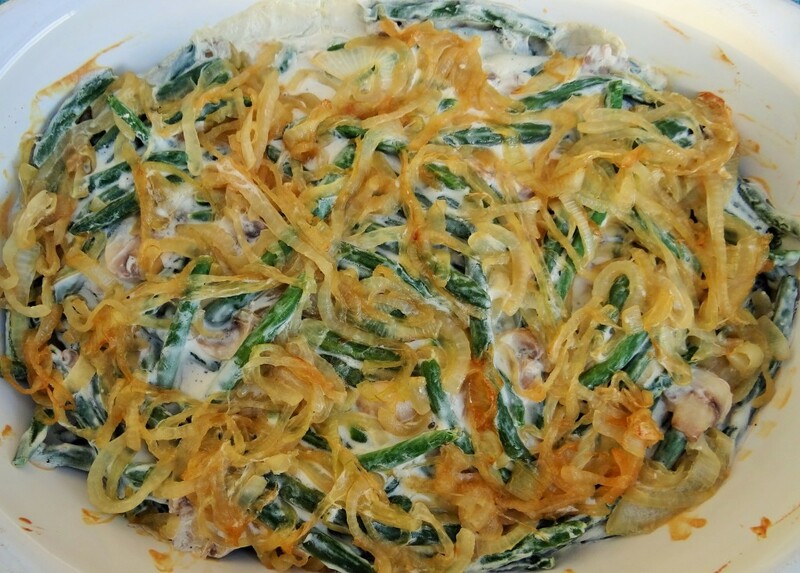 I know, when some of you read this, you will be thinking that it is not a recipe that is any healthier than the traditional Green Bean Casserole. What I feel makes this a healthier version is the fact that you use fresh green beans, not canned. Fresh, whole ingredients like mushrooms, butter, fat-free half and half and caramelized onions instead of the French Fried Onions. I love making recipes with the traditional flavors we all know and love, but making sure to use as little processed ingredients as possible. 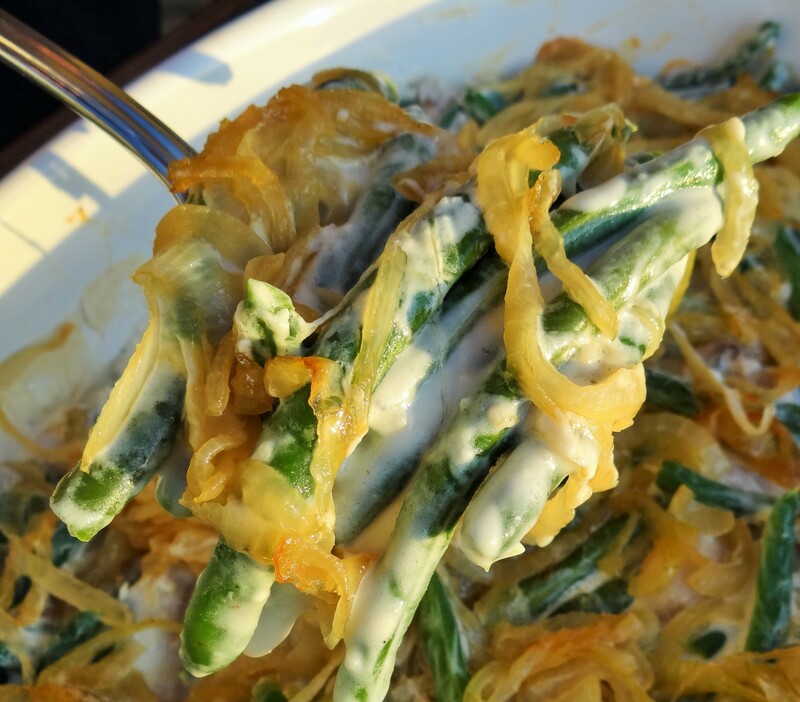 This recipe for Healthy Green Bean Casserole, does exactly that. I personally think you will like it better than the one you have been making for years. Give it a try. Fresh and whole ingredients make all the difference in recipes like this one. Place olive oil in large saute pan. Heat on medium heat. Place onions in pan and cook on medium to medium high heat for 5 minutes, stirring occasionally. Sprinkle with sugar. Turn down to low heat and continue to cook for 30-40 minutes until onions are caramelized and brown. Adjust heat to a higher heat if onions are not caramelizing. Season with salt and pepper. Remove from heat. Steam green beans for 5 minutes. Set aside. Saute mushrooms in olive oil for 5-7 minutes. Set aside. Place a small saute or sauce pan on medium heat. Place butter in pan and cook until butter is melted. Whisk in flour and mix thoroughly. Cook for 1 minute or until bubbly and slightly thick. Slowly pour in half and half. You can add a bit more if you want to thin out the sauce. Season with truffle salt or regular salt, pepper and worcestershire sauce. Toss together green beans and mushrooms. Pour sauce over vegetables. Place in a large baking dish. Spread onions over top. Bake at 350 degrees for 20-25 minutes until hot and bubbly.